Our grilled pork chops recipe is made using a variety of savory spices. Served with a side of sauteed broccoli, drizzled with a white wine and butter sauce. I’m a huge fan of pork; especially, chops and pork loin. Don’t get me wrong, I love bacon too, just not as much. With that being said, cooking pork can get a little tricky. However, by following a few simple steps and letting the meat properly rest, your grilled pork chops can come out succulent and delicious. You will find some tips on how to keep the meat moist in the tips section below. For now, let’s talk about our grilled pork chops recipe. It’s a simple dish that packs a lot of flavor into each bite. The pork is tender and juicy and the sauteed broccoli is perfectly cooked and topped with a rich, buttery sauce. Best of all, the meal comes in at around three hundred (300) calories. People have asked me how I maintain my weight. Which, can be tough given I have quite a sweet tooth. The answer is that I eat meals like this. So, enough chit-chat, let’s get started! 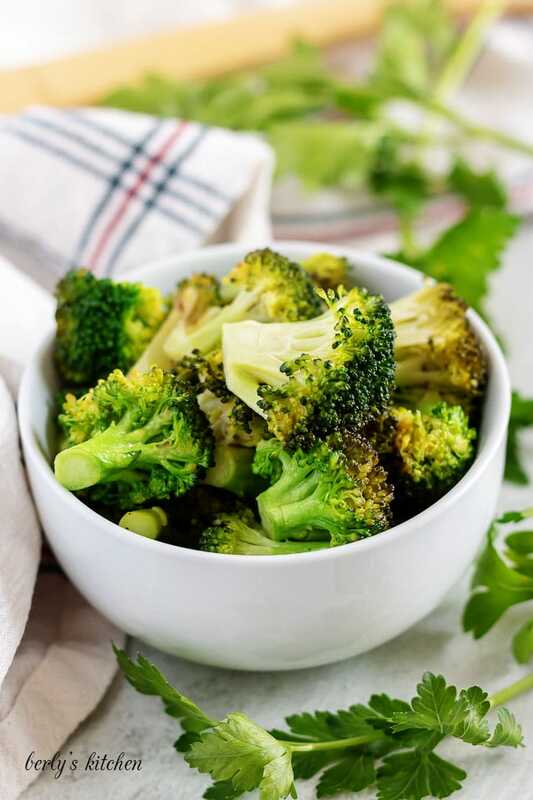 First, gather up the seasonings, preheat your grill and oven, and prep the broccoli. At this point, you can grab a small bowl and mix your seasonings. Put in the sea salt, pepper, garlic powder, and thyme. I use my fingers to mix them together. Now, sprinkle the seasonings over the pork chops. Try to cover both sides liberally with the mixture. Personally, I double the seasoning amounts because I like my meat properly seasoned. However, I made this recipe for a mass audience, so I reduced everything to avoid the, “it’s over-seasoned,” complaints. Once the chops are seasoned, grill them for four (4) to six (6) minutes on each side. I know that’s not enough to properly cook them. But, don’t worry, we’re finishing the pork in the oven. 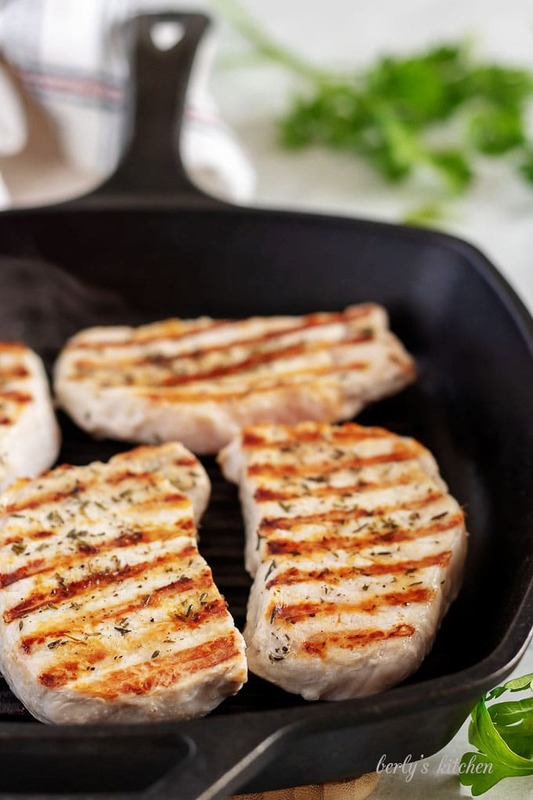 Oh, if you don’t have a grill or griddle pan, feel free to use a skillet for our grilled pork chops recipe. When the grilling process is done, transfer them to oven to bake for around five (5) minutes. When the timer goes off, pull the chops from the oven and let them rest for ten (10) minutes. With the pork chops resting, you can start the broccoli. The meal should be timed so that both the pork and broccoli are finished at the same time. Okay, snag a large skillet and heat it over medium heat. Put the broccoli into the pan and let it cook for around two (2) minutes. After that, sprinkle in the sea salt and white wine. Make sure to stir the veggies as they cook for another minute or so. As the wine evaporates, get ready to add the butter. When the butter hits the pan, it will start to melt. As it melts, begin tossing the broccoli in the butter and remaining wine. Turn off the heat and transfer your veggies to a bowl. Carefully, pour the butter sauce over the finished broccoli. That’s it, you’re all done. 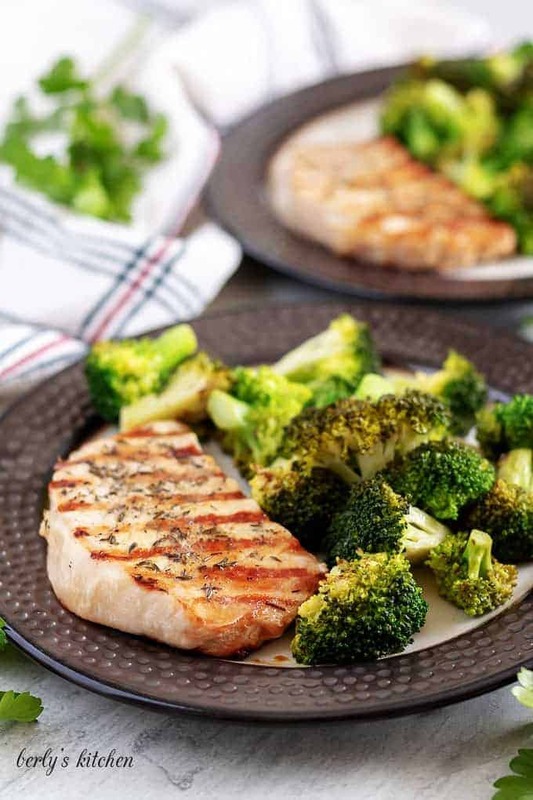 Serve the grilled pork chops recipe with the broccoli and enjoy! It seems people think food like this takes a long time. Well, that’s simply not true. In fact, our Instant Pot Pork Chops, take longer to prepare. 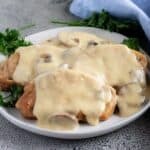 You may not get gravy with this recipe, but you do get a pretty awesome butter sauce. Just something to think about. In regards to cooking times, boneless is faster. For me, I love the presentation of bone-in pork chops. It’s prettier for plating; however, they take forever to cook. “What temperature should pork chops be cooked to?” The proper internal temperature (inside temperature at the thickest point) is 145 degrees F. Then allow it to rest before eating. “I like this recipe, but I don’t drink or cook with alcohol.” That’s okay, you don’t have to use white wine. Beef, chicken, or vegetable broth works too. On the other hand, cooking the wine does remove the alcohol. Additionally, the white wine adds a fruity undertone to offset the heavy, rich butter. But, do as you please. What’s the point of grilling, then baking the chops? Remember when I talked about succulent, moist meat? That’s part of the process. Grilling and searing meat helps to lock-in all the juices. If you just baked them, then the chops would dry out and become tough. 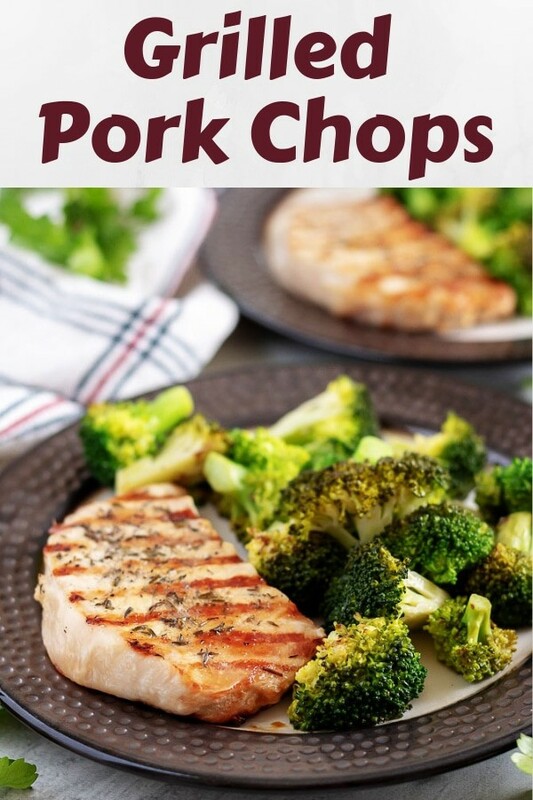 If you enjoyed our grilled pork chops recipe, please leave us a comment and rate the recipe card. You can also find us on Facebook, Pinterest, Twitter, and Instagram by searching for Berly’s Kitchen! Preheat your grill or griddle over medium heat and preheat your oven to 425 degrees F.
In small bowl mix together the sea salt, pepper, garlic powder, and thyme. Sprinkle the seasoning mix onto both sides of the pork chops. Grill them for four (4) to six (6) minutes on each side. Then, transfer them to the oven for about five (5) minutes to finish cooking. Remove them from the oven and let them rest for about ten (10) minutes before serving. While the pork chops rest, preheat a large skillet over medium heat. Add the broccoli to the skillet and let it cook for about two (2) minutes. Now, pour in the white wine and sprinkle in the salt and pepper. Give the veggies a quick stir and let the broccoli cook for another minute. Then, add the butter and as it melts, toss the broccoli in the butter and wine mixture. As soon as all the butter has melted, turn off the heat and transfer the veggies to a bowl. Last, drizzled the white wine and butter drippings over the broccoli and serve the side dish with your grilled pork chops. 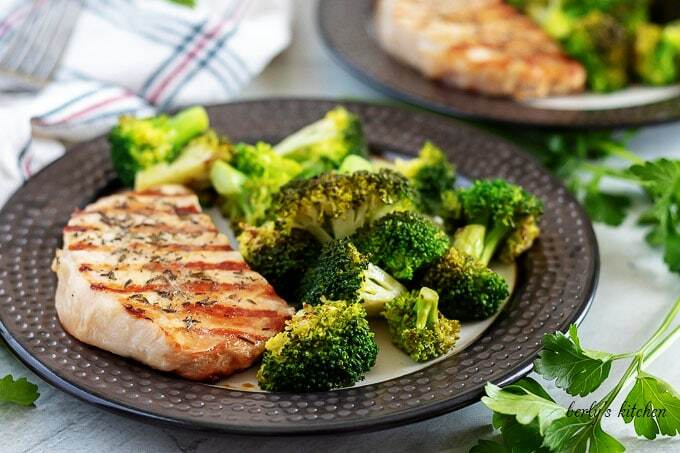 The calories listed are an approximation based on the ingredients and a serving size of one (1) grilled pork chop and two (2) ounces of broccoli florets. Actual calories will vary. 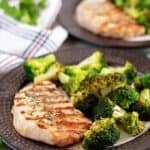 The pork chops and broccoli can be stored in your fridge in a sealed container for up to three (3) days.